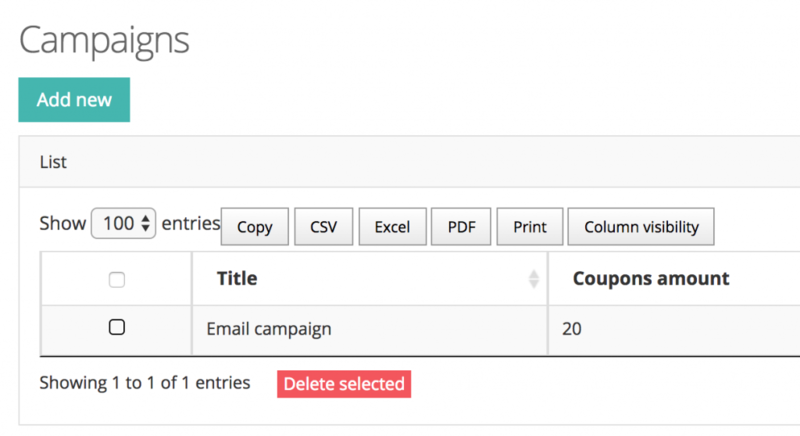 Another new module has been released – now you can easily manage discount coupons and create campaigns. Let me show you how it works. Basically, you have two CRUDs – Campaigns and Coupons, with a one-to-many relationship, so each coupon may (or may not) belong to one campaign. In addition to basic CRUD functionality, there’s a logic of creating coupons automatically when creating a campaign. So you specify the number of coupons to be created, and they are generated automatically. For now the coupon code is generated simply as an 8-number sequence, but you can easily change/extend that logic after downloading your panel. So, login to your admin panel and try it out!